It's that time of the quarter again, when we bundle the once-in-three-months Top Bikes magazine with our own. Yes, we know, some of you are not happy with the arrangement. Especially when you have to pay P45 more for your copy of Top Gear. We can only hope that in doing this, we are able to please those of our readers who are also (even just moderately) interested in two-wheeled conveyance. 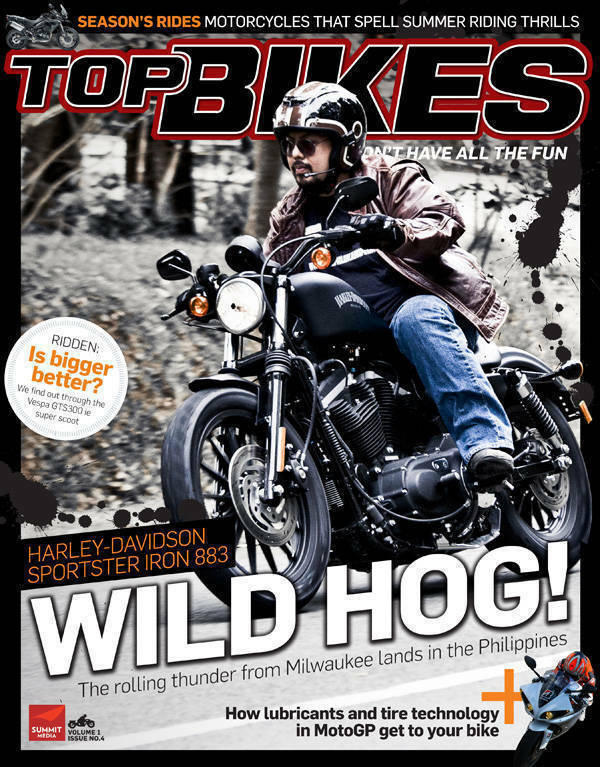 On the cover of Top Bikes' latest issue is the Harley-Davidson Sportster Iron 883. As you know, the iconic American motorcycle brand entered the local market last weekend in a grand and loud way. You can say Top Bikes got the scoop. Among the motorcycles featured in this issue are the Aprilia Mana GT 850, the BMW C600 Sport and C650 GT, the KTM 1190 Adventure R, and the Triumph Tiger 800XC. Reviewed, meanwhile, are the Vespa GTS300 ie and the Harley-Davidson Fat Boy Lo. There's also the magazine's exclusive interview with MMDA chairman Francis Tolentino, in which the traffic czar talks motorbikes. "I created the (MMDA's) color-coded bike units to define their duties," the occasional biker said in the exchange. These and many more in the new issue of Top Bikes, bundled with the March 2013 issue of Top Gear Philippines.